Justin Reed also has a musical side. WOOD - Meet Justin Reed, man of many hats. He's a historian, radio disc jockey, musician (of sorts) and pulpit minister at a historic Middle Tennessee church ... all at the high-voltage age of 23. When not busy, he has a day job at De Hoff Christian Bookstore in Murfreesboro. Oh, did I list that he's also a graduate Communications' student at Middle Tennessee State University? "Being minister, that's my calling in life, dating back to when I was five years old," Justin shared. "... Preached my first sermon at age 13 at Ivy Bluff Church of Christ. Been writing and preaching sermons ever since." The Justin you encounter depends on which hat he's wearing that day. He's an avid historian, especially Biblical history and a disc jockey who knows the history of most songs he spins, whether it's country, gospel or blue grass." "Long live the king, Bob Wills," the DJ cadenced excitedly on the air, "the king of Western swing." "People out in radio land like it when I know the history of a song that touches their heart," DJ Reed explained. Now, about him being a musician, "of sorts." 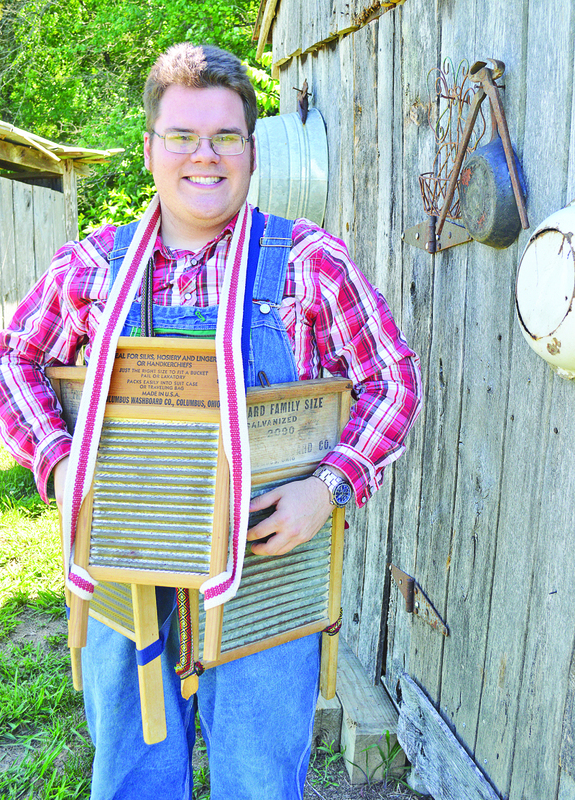 Meet "Lester," his musical washboard named after the late famous "Lonesome" Lester Armistead, whose group "The Tennessee Mafia Jug Band" has packed the Arts Center of Cannon County more than any performing group in history. "We miss 'Lonesome Lester,' a class act along with banjo maestro Leroy Troy, both of whom interviewed on my show," accounted DJ Reed. "Lester" is one of five ancient washboards he has in his repertoire. When asked if he had any musical talent, Justin replied: "Not a bit, that's why they let me scratch and screech around on my washboards at musical events." To get in tune for bluegrass festival appearances, he dons over-sized overalls, and drapes three to four washboards around his torso attached to homemade "straps" made by one of his loving grandmothers. Born in the beautiful rolling hills in the shadow or Short Mountain the son of Johnny and Suzanne Reed, he doesn't have to travel far to preach at Wood Church of Christ, a landmark church and cemetery located on State Route 146 in Cannon County. The young minister credits longtime church member Naomi Blair, age 84, with being a devout church member: "She's my go-to person when I need information from the past." "Justin D. Reed is a fine young man," Mrs. Blair confirmed. "He's the youngest minister ever to serve at our church." Minister Reed credited members Franklin Daniel and David Parton with crafting his office's sturdy office desk, made of wood. "Justin is devoted, vastly talented and always ready to help someone," confirmed lay minister Billy Henson, who lets young Reed have a Sunday off by filling the Wood church pulpit each third Sunday of the month. "Justin is a great young man of God," testified Patsy Henson who regularly attends Wood Church along with her husband. When asked about the difficulty of creating a sermon, Justin responded rapid-fire, a trait of an obviously exuberant personality: "See that simple-looking pencil? (I) got the idea for my 'pencil sermon' from a personal email. "1. Hold on...hold that pencil firmly in your hand. That's where Jesus holds us. "2. All (of us) can make a positive mark in life. "3. Stray mistake 'marks' can be erased, see the eraser on the end of that pencil ... as in Christ's forgiveness that wipes our slate of sins clean when acknowledge Him as savior. "4. Sharing what is in your heart ... sharing your mark which is inside your soul. "5. Like on a pencil, the sharpening of your personal life can be painful, but makes you better for having been sharpened." He added: "I love preaching from the Bible ... love teaching joyful, but practical lessons of living and learning about Christ, using Him in our everyday walk through life." His church "serves people of the Short Mountain community" dating back to the 1800s, when William 'Billy' Wood, the great grandfather to Cannon County Historian Joe Daniel Davenport, donated land for Wood Cemetery that surrounds the Wood Church of Christ. "William Wood was the grandson of John Wood, Cannon County's first Postmaster and one of the original settlers in Cannon County in the 1807-1830-era," confirmed Davenport, who heads the Cannon County Historical Society. Minister Reed confirmed language from the original property deed, which specifies if ever there are musical instruments played in Wood Church of Christ the land reverts back to the donor land owner. "They use a record player today for weddings here," the young minister ordained. Perhaps the most public aspect of the minister's life to date is not the pulpit, but over MTSU Radio Station WMTS (88.3 FM) that airs the "Justin Reed Show" on Thursday mornings from 9 to 10. Judging from call-ins, truckers love his radio show. "I have a lot of truckers from Interstates 24 and 40 tune in on my shows, because not only do I play their music, I share a lot of history of country, gospel and bluegrass," voiced DJ Reed as he was being interviewed for this forum while live on the air. "I believe in having fun on my program, including the 'call-ins'," confirmed the DJ. "I've interviewed the famous, such as Grand Ole Opry star (the late) Jimmy C. Newman and banjoist Leroy Troy." He arrives at the radio station located in the John Bragg Communications Building around 5:30 a.m. each broadcast day. His ministry serves the faithful flock of Wood Church of Christ that overlooks Wood Cemetery, where history quietly resides at the foot of Short Mountain. His radio message carries out across the beautiful rolling hills of Middle Tennessee.